Ballintubber’s quest for a first-ever Connacht Senior club championship title ended in defeat this afternoon at MacHale Park. While they took the game with confidence to defending champions Corofin in the opening half, they had no answer when the Galway lads turned the screw with increasing effect after the break. 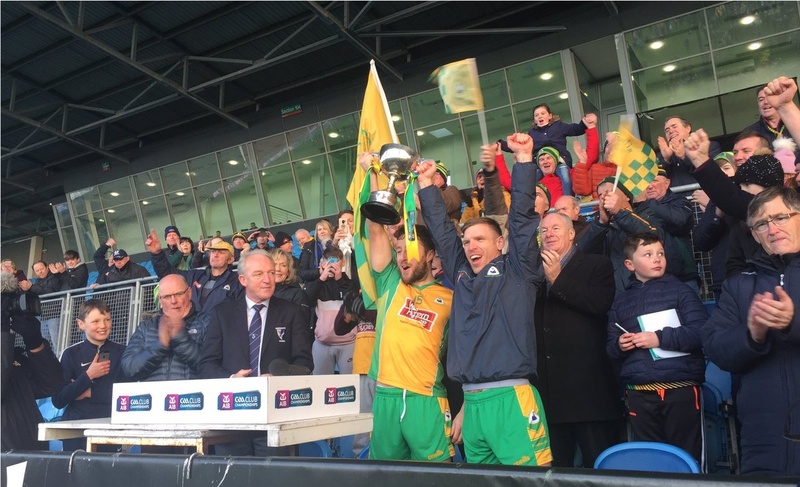 Corofin won by 2-10 to 1-9 at the finish, to win their third Connacht title on the spin and their ninth in total. Ballintubber enjoyed the best of the exchanges in the first half. They opened much the brighter, were on loads of ball and posted a few nice scores to settle them down. A booming point from Cillian O’Connor was their fourth of the afternoon, with just ten minutes played, as they opened a three-point lead on their vaunted opponents. Corofin probed patiently for openings in the Ballintubber rearguard. Much of this effort, though, saw the ball being played laterally with the defensive shield erected by the hard-working Mayo champions holding up well to the pressure. A long scoreless spell was ended when Corofin notched their second point of the day. Soon after their captain Mícheál Lundy bagged a goal – gathering the ball near the end-line, turning back in and creating space for himself before lashing it to the net – and so, after all their hard work, Ballintubber found themselves a point in arrears approaching half-time. They responded admirably, however, to bag 1-1 in quick succession at the other end. Alan Plunkett showed his marker a clean pair of heels to burst clear and shoot over from distance. Then Jamsie Finnerty – in at the start for the injured Stephen O’Malley – underlined once again his goal-poaching pedigree. Played into a one-on-one situation with the Corofin ‘keeper, the youngster showed admirable coolness as he rolled the ball past Bernard Power. It took a deflection off the post before hitting the net, restoring Ballintubber’s three-point lead at the break. A Gary Sice free for Corofin opened the second half scoring and a point from play by Jason Leonard soon after cut the gap to one. Mike Farragher then hoisted a monstrous effort from almost fifty yards out over the black spot to level the decider up. Ballintubber’s opening attack of the half ended with a wide from a narrow angle from Damien Coleman. Corofin broke rapidly from the long-range restart, Gary Sice knifing through the middle, with the ball transferred rapidly to half-time substitute Ian Burke who slammed it home. A Cillian O’Connor free opened Ballintubber’s second half account as they sought to get back on terms. The same player missed a second free soon after from roughly the same distance but in their next attack he was fouled by Kieran Fitzgerald as he sought to break clear. Cillian knocked over the resultant free to cut the gap to one. Corofin hit back rapidly. An Ian Burke point from play followed by a Gary Sice free pushed the champions three clear once more at the halfway stage of the second half. Corofin were by now spraying the ball around with increasing confidence as they sought to close out the game. Given the ball in space out on the right wing, the pony-tailed wing-back Kieran Molloy let fly from distance to increase the lead to four. Another Sice free just after lifted Corofin five clear with ten minutes to go. Cruising at this stage, Corofin retained possession with the confidence of champions. A necklace of languid passes ended with Liam Silke raiding forward from corner back to belt it over. There was no way for Ballintubber. Points from play by Alan Dillon and Michael Plunkett cut the deficit to four as the game went into injury time. It was, however, too little too late. Corofin won by four at the finish to claim the Shane McGettigan Cup for the third year in a row. Well done to them and commiserations to the Tubbermen. Defeat was also the lot of Tooreen’s hurlers in yesterday’s Connacht IHC decider. Like Ballintubber today Tooreen, the defending provincial champions, battled hard all afternoon but two red cards proved fatal to their chances against Galway’s Oranmore Maree. Tooreen eventually went under by 1-20 to 1-15 (match report here). Hard luck to them. I thought the Ref was very hard on Ballintubber. There was some great players playing today, Cillian O’Connor, Kieran Fitzgerald, Alan Dillon, Gary Sice, Diarmuid O’Connor, Kieran Molloy but Ian Burke was on a different level and has been in every game I’ve seen him play in 2018.
another win for a Galway team over a Mayo team, men/ladies/Club when is this going to Stop. Hard luck to Tubber, could nearly be a good thing for Mayo Gaa that they lost???. O’Connors will get a rest now, and Gibbons might be worth another shot in the league. Have to say I think Burkes exploits a tad over-rated today…”on another planet” i think not. He got on the end of some fine team moves against an increasingly tiring defence. The damage was done by other Corofin players, he just finished a couple of scores. Heard he had flu, so still a good contribution from the bench. Good luck to them in the semis. Yes it’s annoying to see Galway teams beating Mayo teams at all levels lately but it will swing back our way again soon no doubt. Ballintubber but up a brave effort but Corofin are a class above most and it showed in the second half. That experience and know how really was on show in the second half. Molloy excellent and Burke off the bench goalies with his first touch. Ballintubber also kicked a few bad wides when on top in the first. Diarmuid not himself today. James Horan will be happy to have the O Connors back although rumor is Cillain May opt for surgery on an ongoing knee issue. Better off to have the o’connors concentrating on the the mayo squad. I’m sure they’re not thinking that way but an all action player like diarmuid could do with the rest. Hard luck, Ballintubber, but overall Corofin had better players, and a stronger bench. Yeah, Ian Burke is a class player – worth the entrance fee – soft hands, plays the angles to devastating effect. You just can’t coach this type of spatial awareness. However, I will admit we need to improve, and if it’s Crokes in final, it will be some occasion. They bullied Corofin out of it a few years back in Limerick. So motivation won’t be a factor. Yes, John Mortimer, Ballintubber were unlucky today. They met Corofin and that is bad luck, as several teams discovered in the past. I suspect more will discover it in future. Ballintubber played quite well in the first half, much better than against Aghawillan. But Corofin were that step ahead in the second half and deserved their win. I wudnt worry to much about Corofin beating Mayo teams, there an unbelievable team probably the club team ever in Connacht with the Crossmolina 2001 team. Galway have beaten us very narrowly in the month of May the last 2 years in which we have had a key player sent off in both games, and there 2nd half showing against the Dubs in August was way off any performance Mayo had with Dublin in the last few years, we were beating Galway teams out the gate in every grade from 2011 to 2016 eventually it had to turn abit.With James Horan back and a badly needed winter rest I expect us to be back winning Connacht titles and challenging the Dubs next season. Fully agree Chris. Im starting to get excited about next year. Finally a favourable draw in Connacht, added to the best preparation for a league campaign in years. Cautiously optimistic..
Commiserations to Ballintubber who put in a spirited performance today. They pushed Corofin all the way and certainly made them earn their victory. It’ll be disappointing for the players that they didn’t make it through to the AI semi’s next spring. 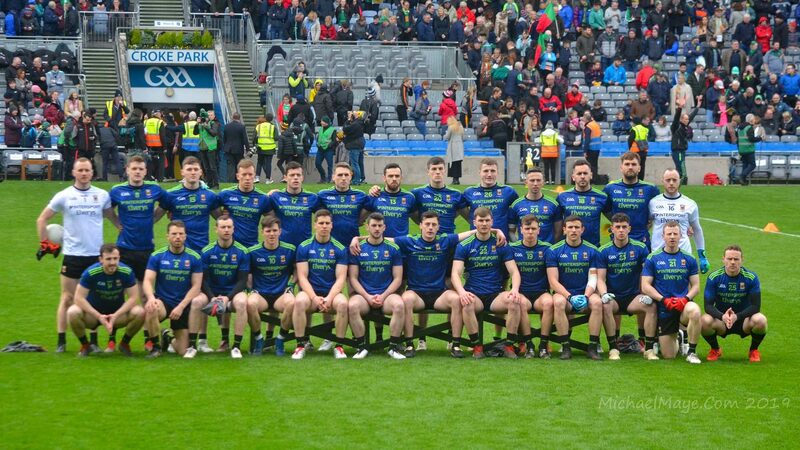 However, agree with earlier comments above that from a Mayo team perspective it’ll do the panel good to have all clubs finished with their respective Connacht campaigns, give these players a rest and get everybody fully focused on the national league and the development of the squad through the spring. Well done to Corofin a class club team and hard luck to Ballintubber who made a right game of it Have to admit that Ian Burke is just a fantastic footballer. Amazingly quick hands and very intelligent. Hope they go on to win it now. Some good performances from the Tubber lads. A bit of a rest now and we will all go again in January. Thinking back on yesterday’s Connacht Final I have to saay that Ballintubber deserve a lot of credit on their performance. Corofin are a hardened experienced team, many of them with two All Ireland’s under their belt. ‘Tubber on the other hand had a few quite young players on their side who have the capacity to learn a lot from yesterday. For example Ciaran Gavin was caught in possession a number of times and hopefully that will not happen again. Jamsie Finnerty took his goal very well and seems to have developed considerably during the campaign considering that he was not on the Mayo U20 squad this year. If that squad were being picked today he would be among the first names on the list. No doubt he can continue the progress. I think Tubber did very well in the first half & won midfield easily . Does anyone know the free stats for that first half? CoCi feel is gone off the boil–too much football–i feel a rest will do him good. He was lucky to avoid a red card at the end. Coming out of hibernation after turmoil of 2018!!! Hard luck Ballintubber, they played great first half football. Hope Cillian’s knee will be ok. Diarmuid looks worn from football. Hopefully break will do them good. Could anyone who was at Shelbourne Fundraising Lunch give us a report on day. Saw some pictures on social media. See ye all in 2019 for lots of excitment!! Kieran Molloy good enough to play for any county team in the country. Athletic, physical and superb long range passer of the ball. Corofin patched up their shortcomings in dressing room at half time, lot of credit to management. O Connors will def benefit from the rest and Gibbons put in a decent shift.. Thought Tubber gave it a good lash and were well in it all the way. Just made some basic errors that Corofin pounced on. Thought Diarmuid would be more influential, though hard to say he played badly. Corofin are some outfit between the 30 & 49 minute they out scored Tubber 1-8 to 0-2 and effectively won the match in 19 minutes. They moved Farragher onto DOC in the middle and that swung the match, he gave them an enormous platform in the middle and Steede began to dominant Jason Gibbons. It was amazing to see Fitzgerald take command at the back, at 37 he marked Cillian from the front and he ordered the entire Corofin fullback line out a couple of metres after Dillion, O’Connor and Gibbons kicked long distant scores. There were no more long distance points after the Jason Gibbons effort. They only conceeded one free inside the 45 in the first half, and that was a tangle of legs with two players running for the ball, their disipline in the tackle is something they appear to pay serious attention too. They only conceded three scorable frees in the second half and Cillian missed one of these from in front of the posts. It is amazing to think Galway don’t select Wall, Farragher or Molloy. You could see why Ballintubber went so defensive, following the second goal. They put on a full press for the only time in the game. Sice called the kickout from the 45 line he dragged O Connor to the middle then changed his run and turned to run onto a ball Power drove into the Ballintubber 65, one hand pass and the ball was in the net. A preset move of the highest order with Corofin players sprinting from the half back line to overlap if required. On twitter today the don’t foul page have the stats from the match up and the winners conversation rate is of the highest order. They will take beating by a serious outfit was Alan Dillons comments post match. They will have the experience to bridge the gap between November and the semi finals in February, they may do back to back titles in March but they will dominate Galway again next year and with a favourable home draw for Galway teams against Sligo, Roscommon and Mayo in the Connacht club championship they will be hard stopped unless Castlebar, Breaffy or someone else in Mayo steps up. ill start again . Dates for your diary .Mayo/new york v roscommon/leitrim on sunday 26/05/2019. Connacht final on sunday 16/06/2019. Thanks Jimbo, hopefully both will be relevant dates for Mayo followers. I’m marking them in my diary. Very good summation of last sunday’s game by GAALoopy. Corofin patched up well at half time. DOC has great strength and speed to get himself out of tight situations. Bound to benefit from a good rest. Any posters have views on experimental rules? Definitely worth trying I’m, no harm in taking the cushion of a badice hand pass away from players, should lead to moving the ball forward with greater urgency…. I have noticed where Mayo Club Stars awards have been moved from December 8th to January 12th 2019. This is very unfair to the players who are in the Mayo set up for 2019. 2 weeks after those awards those players will have to tog out. Why was this date changed?, and when it was changed, could they not have put it on a week later. Why I say this, the club scene is over and I,m sure all the players involved in all star selection would have loved to have a drink together and have a bit of banter about the year gone by. This now wont happen as the Mayo players wont be allowed to have a drink or 2 as league will be starting in end of January. Mayo News should have a bit more understanding, Its not many times in the year you get a bunch of star footballers that would love to enjoy themselves. The date was shifted to suit potential attendees, True Grit. The original date involved a major clash of events, which only came to light after it was announced and would have meant that loads of players wouldn’t have been able to make the Club Stars bash. The only viable alternative date that could be found was 12th January, which I’m sure no-one sees as ideal but is still the best available date. Not for me, though – I would have gone had it stayed at 8th December but I’ve another commitment in the diary up here on 12th January. Which just goes to show that you can’t please all of the people all of the time! Good article on the 42.ie today about Andy Moran having no hesitation staying on in the mayo panel. Even at 35, no defence will want to see him warming up on the sideline to come on. That article on Andy, by Mike Finnerty is also on RTE website. Andy is a great role model. Good on him for giving it another go. Sad to see many comments mocking the man on national forums and social media today by keyboard warriors who most likely have sad pathetic lives….it it’s one thing I hate about the internet is every gobshite has a voice…and believe me there are plenty of gobshites out there. Re the proposed new rules does anybody know whether a fist pass will now be now counted as a handpass? For example are two handpasses, a fist pass and another one or two handpasses legal? If so it will make refereeing even more difficult and if not the wording of the new rule has to be very specific. I suspect that there are an awful lot of players and followers out there who do not realise that a handpass was illegal and we played well enough without it. Andy’s- I would expect a fist pass and handpass will be treated the same – three in total. Otherwise, it would be impossible to implement. It looks like the trial changes will be reviewed after the pre-season competitions and before the league. This makes sense as if there is something obviously not working it’s better to change before the league- otherwise the league games could be ruined. Club u21 games Mayo News reports. Peter Naughton played well and Marcus Parke on Colm Moran. Mark Moran helped turn the game from the bench. Dacin Takkos and Stephen McGreal played well. Colin Gill came on and made a big difference. Conor Diskin will be back for the semi with Nathys. I think it will be a Westport Claremorris final. I have notice alot of teams have players missing or injured. Claremorris had Conor Diskin, Mikey Higgins and 2 last year minor panelist Brian McGuinness and David Gannon missing. Colin Gill only came off the bench. Knockmore were missing Cormac Reape and senior player Nathan Hardy only came off the bench also missing last years minor panelist keiran King who has been playing for their seniors. Belmullet were missing Ryan o Donoghue. Westport were without Fionn McDonagh and Paul Lambert. St Nathys are without Cian Hanley and played without midfielder Luke o Grady in their QF. mayomessi,Cian Hanley isn’t u21 this year.Looking forward to the 2 semi finals at the weekend.Lots of talent on show,hope the weather improves. @mayomessi, I believe some missings or off the benches are just circumstances rather than injuries. St. Nathys I think need to keep Darragh Kelly, Sharoize, Luke O’Grady and Cathal Horan close to each other around the middle and just go for it in a shoot out. Keep Kuba up front close to goal with Kane Philips. They could also try Darragh Kelly at 14 and have runners coming off him. James McCormack, Stephen McGreal, Conor Diskin, Colin Gill nd Matthew Macken will power through them if they try and sit back.